There's not much persuasion needed to get me out on a stream. I am one who will angle in most conditions but I must say the fair weather days seem to feel so much better. On my last outing the weatherman was calling for a mixed bag of conditions ranging from sunny skies to afternoon showers. So I grabbed the little 2wt and headed out to find a few fish. As I parked the car I sat there finishing my coffee and just felt the sun work its warm magic. Getting out and preparing to find my way to the stream I saw a rock wall. The sun as it hit the various stones reflected a multitude of colors. These colors were not vivid but muted but seemed to be all working together to inspire. As I continued to work the stream with some success in the ability to attract trout to the surface, I said attract not catch. I came to a pool where it seemed to shout,"there is a brookie here for sure". The pool was deep and dark with good flows and lots of hiding places. As I floated the fly through I was ready for the violent confrontation I though was a sure thing. This did not happen, and repeated drifts accomplished the same. Keeping an eye to the ever changing sky, along with a distant rumble of thunder, made me realize the day might end soon. I came to another pool that appeared to have a fish rising. I observed one rise and soon placed the fly in the feeding lane. The fly worked through without a notice. There was a large boulder at the head of a swift run. This looked very good and on the second attempt the trout struck. 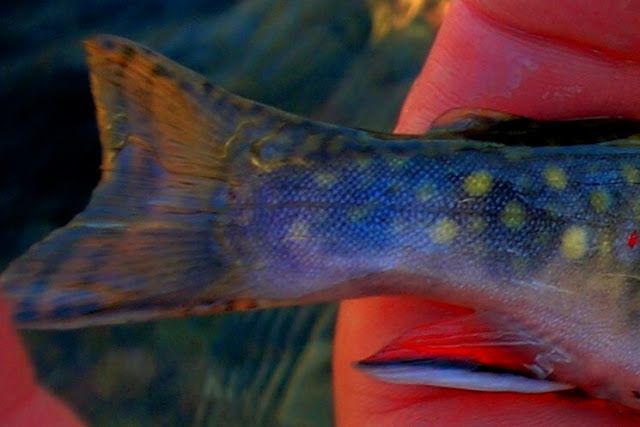 A brief confrontation ensued and a beautiful wild brook trout lay at my hand. By this time the thunder was closer, with rain and a few hail stones mixed in for comfort. As I made my way to the car I thought about being inspired. Looking at such places one has to say "The trout of the day will come from here". Did my feeling for the certainty of success in the last pool which proved wrong inspire me to seek success near the boulder? A brook trout taken on a changing day. Inspiration you bet. "Bridges", all of our lives we have come into contact with these structures. They have enabled us to cross waters and obstacles which have seemed to block our way. In the last few years I have had a few of these tough waters to cross and for the most part have been successful at it. Early this year I was given a choice to build a bridge across a lifetime of doing things which now seem to be not the best of choices, and start to help correct those not so good ones. It's going to be tough, believe me, but with the support of Jeanette and my family I'll be just fine. "Hell I want to be chasing brookies around for several years". My widest bridge will be the gap of fried, high fat useless calories in my meal planning, and cooking. This has to be eliminated and replaced by much better choices. This is a better choice, fresh escarole washed and seasoned and eaten raw. That same escarole sauteed in a touch of olive oil, garlic and lemon juice. Stuffed cabbage. Instead of using beef, I used ground chicken, brown rice. As I learn to tighten the wraps on these new choices and finally finish putting in the the last planks of yet another bridge of life. 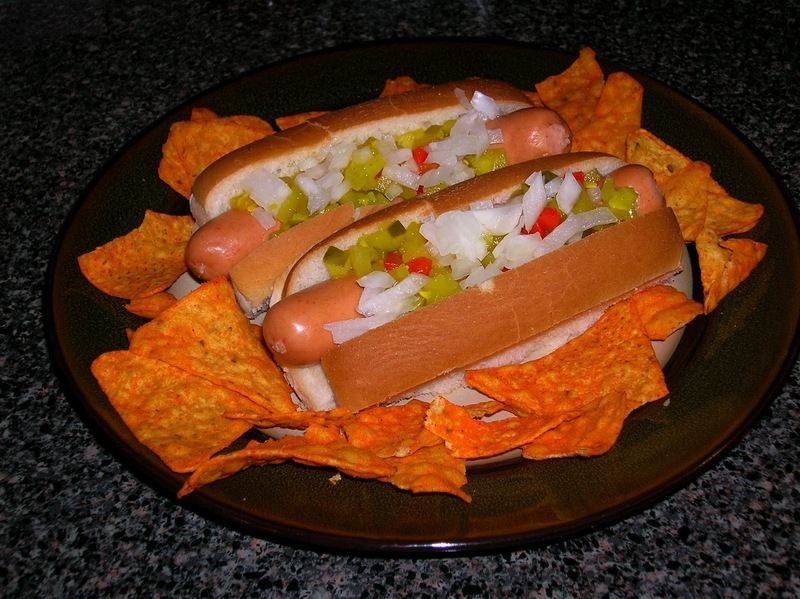 I want to let you know I have had one hell of a bout with a intestinal virus this last week. I plan to play catchup on all you posts. Fished this wonderful small wild trout stream. It's a stream that holds both browns and brookies. And like previous visits there have been stone flies hatching in droves, but not a lot of trout rising. Now in a large tail water with various species of insects you would say the trout have choices and stages to dine on but in a small stream it's eat the one that's there or go hungry. So my thought was they were feeding on the nymph, which might have been the case, but with my not liking fishing with this type of fly I had the choice of a wet or a dry. I chose the dry, a reversed parachute emerger. It is a simple pattern as far as materials go, but tying it can be a bit of a pain. It's a pattern first brought to my attention by fly tyer and angler Roy Christie. Well my decision proved to be OK for the trout responded, and the makings for a fine outing began. Spring, the first greening up of stream side vegetation. A handsome wild brown and the fly he could not resist. Late morning, first day of spring and a hemlock shaded trout stream. Accept for the tying of the parachute at the rear of the hook it's a pretty simple pattern. Another resident who could not let that struggling fly be. 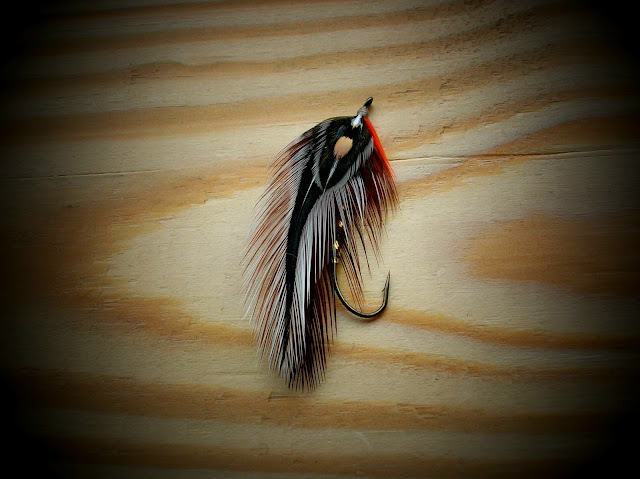 "Grizzly" it's not just for "Buggers"
These feathers are very versatile and can be used for many streamer patterns. 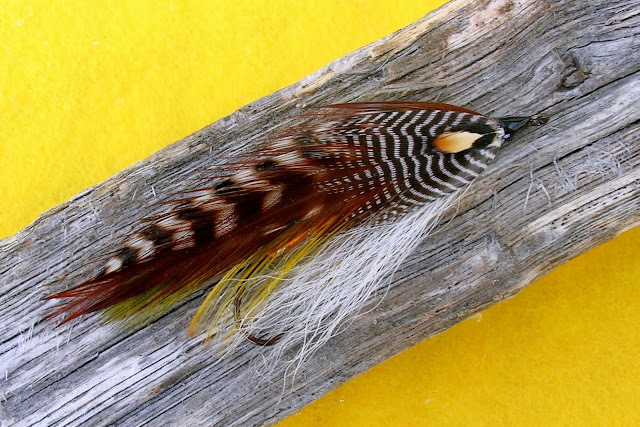 When combined with other saddle hackle can give very life like and natural looking forage fish patterns. When you feel creative and add color you can achieve some very good attractor patterns. Most grizzly hackle can be a bit on the narrow side, especially when purchased as "bugger packs" but their price is reasonable and when teamed up with wider saddle hackle the effects can work well. The Brown Olive Ghost with its grizzly hackle gives this streamer that shadow effect. 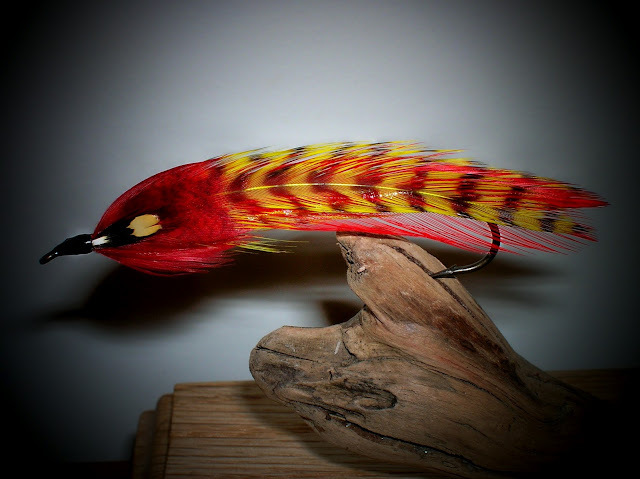 The vibrant colors of this streamer with its yellow grizzly hackle makes a fine flashy attractor pattern, and possibly a natural "Perch" pattern. This pattern uses a natural grizzly feather. It could perhaps represent a variety of minnows found everywhere. Or it can work very effectively as a "smelt" pattern, for which it was tied to represent. "Hogsback"
So try a few grizzly streamers, you'll be surprised how good some of your patterns can be. Wishing everybody a very "HAPPY ST. PATRICK'S DAY". I will start preparing a traditional Irish corned beef and cabbage dinner. I will enjoy a variety of Irish music while tying a few streamers, and start to think about my favorite leftover, corned beef hash. This is the "tail" of a friend of mine. Although I have only known him a brief time, he has been very true and undemanding. He has seen many changes some good and some very bad. His home and the access to move about freely has been altered sometimes to the point of his leaving. He is said to be a forecaster of the health of our future "The Canary in the Coal Mine", a title he did not seek. His beauty is not exceeded by much in the natural world, and he will bring a feeling of joy and satisfaction to all who hold him. His struggle for survival for thousands of years must be lightened, and we must all do what we can to make this happen. These tails have been the driving force to survival of this native. Its roads have not always been the smoothest. But the colors show its beauty and the unbroken determination to survive. These places along a small stream can very productive, and this one did live up to that. Good morning friends. I started this post with the intention of telling you of the last few outings I've enjoyed fishing a small stream. I will fulfill that idea just as soon as the Green Mountain takes hold and jolts my memory and allows me to put it down on the page. This winter has been incredible as far as the weather. It's been a mild one for sure. This has led to some fantastic fishing including my last two outings. 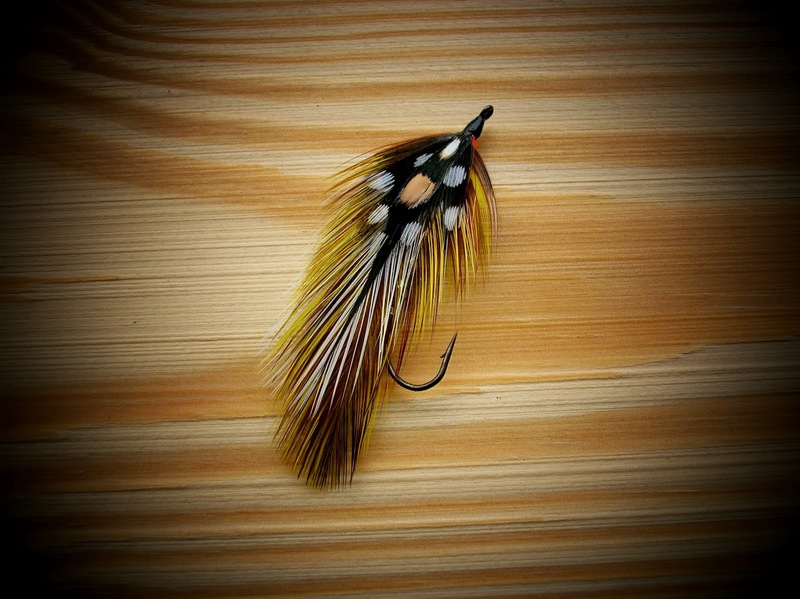 I started fishing dry flies, the first one a Haystack pattern. If your not familiar with the Haystack it's a pattern created by Fran Betters. It's a comparadun that will bring attention to the surface. If you look at the fly with its wing flaring out it looks like a haystack. Well it didn't take long to hookup on a few wild brookies, that clump of hair was to much to let pass. I also used a reversed tied parachute. This pattern is a wonderful floater and has great visibility, and when pulled just under the water it can drive fish "wild". The beauty of these patterns is they can be tied using many colors and represent a lot of bugs. Trout were active in many locations on the stream. This riffle saw several fish chase the fly. Wonderful times in the first weeks of March. "Skunk Cabbage" it's breaking the surface is a sure sign of spring. It's colors are brilliant when the sun hits the plant just right. One of the pleasures of spring, wild brookies on a dry fly. A Haystack dry fly. The results of a reversed parachute. The brown was released quickly vowing not to eat that bug again. Breakfast for lunch...ah what the hell. Thursday evening Jeanette and I were treated to a wonderful show put on by our grand children and the students of the school they attend. A Celebration of Children's Art. The hand made offerings were outstanding, and you could see the love put into every piece. The items were at auction and we were fortunate to be the highest bidders on these birdhouses of Morgan and Ethan. Seeing this is a fly fishing blog I thought I put in something so related. Another fine book written by Fran Betters. This one is not a how to book but a where to go book. There's a great deal of valuable info in its pages. 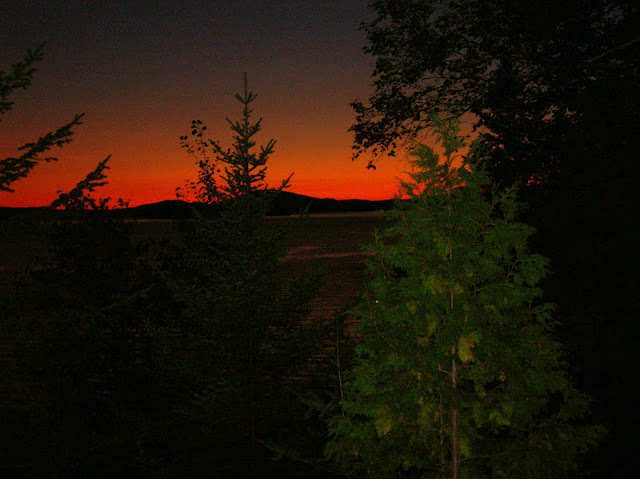 And even if one never visits the Adirondacks it's still a joy to read about them. Frans book and a few of his patterns. Two "Bombers" and a "Haystack" well almost. It has a few different materials. I'm going to fish this fly and I'll let you know how it does. My love for Chili is almost a great as Pasta and fly fishing. I picked this blend up recently and I'm going to try it soon. It has to be good, just look at the name. One of the new streams I've found. I will fish this stream for sure. This is a post about some of this and that, sort of a garage sale. While I've been out along the streams a bit some of the photos are of past outings and those that I love. While fishing the other day I could not believe the clarity of the water. It was amazing. Maybe why the fish were so spooky. Brookies are the same, but are different. This one was taken from a northern Connecticut stream that was a dark tea tannin stained. The brookies colors were beautiful. Every sunset is beautiful, especially in the fact we are able to see it. But there are those that really stand out. This one is in western Maine in late September. "Apple Pie", what else can be said. Along with fishing small streams another pleasure I enjoy is tying streamer flies. Most of the streamers can be fished successfully, although they are not practical for small streams. Larger rivers and lakes and ponds are where these flies really prove their value. The two streamers I have tied here will be put to the test in the next week or so on the river that is pictured first in this post. This streamer takes the shape and color of this widely known forage fish. Its size and swimming motion will bring out the hunger in most predators. This streamer is called "33". Its name comes from the fact its wing is tied with six saddle hackles, three on each side. They are of different colors. 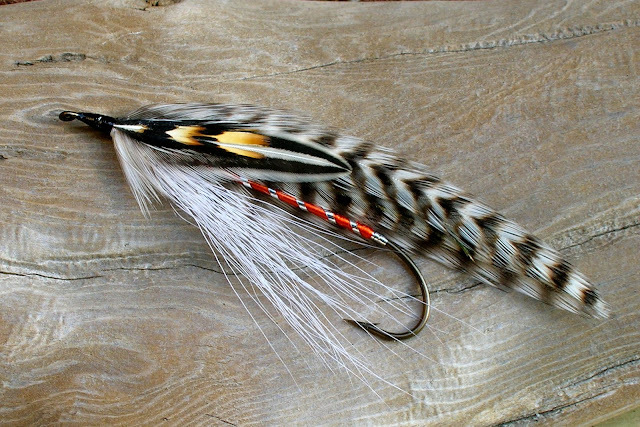 The one thing in common with both these streamers is that both have an outside hackle of Silver Badger. This feather provides a great natural silver/gray fish color along with a natural black lateral line along the body. The success of a small stream angler depends on many things, proper gear for the task, access to a stream, weather, and several others including a few trout to catch. Probably the most important need is clean cold water. Many of the streams I've fished in the Northeast are small freestone types with a good source of cold water. These sources are from underground springs which release ground water into the stream. I average years where rainfall is ample the stream flows as well as temperatures remain cool and trout thrive, and are beautifully healthy. But in those dry hot years when rainfall is at a premium another factor comes into play. This factor is the trees and various woodland foliage that grow along side the streams. I have seen the what this means first hand. We experienced a very hot dry summer a few years ago. It took it toll on many trout streams and the trout that lived there. One stream that I monitored close had flows reduced to a trickle, the brook trout that lived there were confined to several deeper pools and near deep undercuts. I observed these small trout move into the shallow riffles to access what little oxygen was being brought in. Late in the fall of that same year I walked the stream, we had received enough rain to bring stream levels up. 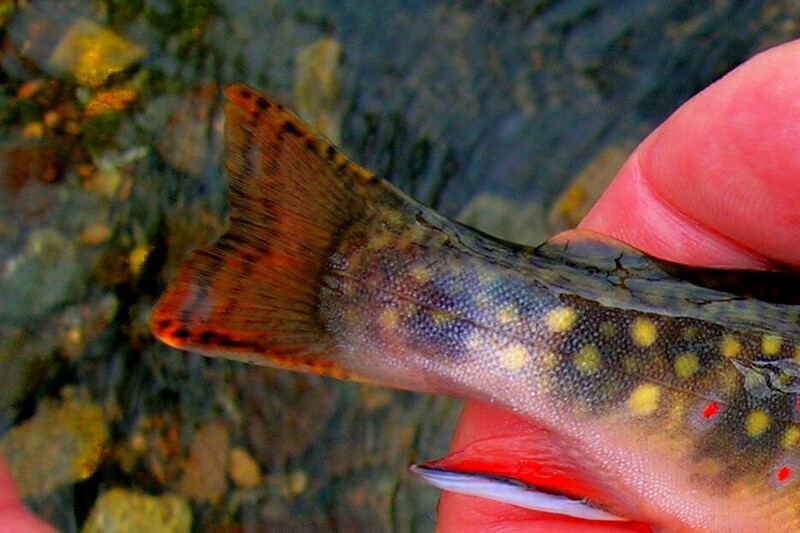 While walking I could see spawning brookies, not just a few but many. Some of the fish were quite large, I would have thought they could never survive. That's when I realized their survival was because of the fact that water temps never exceeded 70 degrees, a number that means life or death to trout. I took stream temps that whole summer and never did the temp exceed 68 degrees. I believe the reason for this is the woods. The leaf canopy gave enough shade to keep what little water that flowed cool enough to sustain life. Maybe the squirrel should be a symbol for T.U.? Not only are the tress beautiful along our streams, but so valuable to the life in the stream. 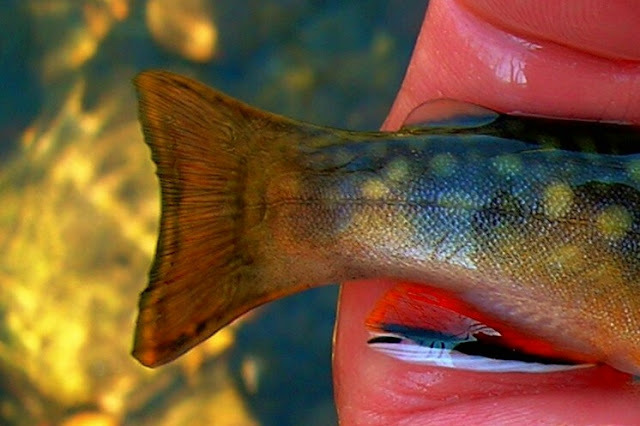 The wild brook trout is alive and doing well in these hidden waters, thanks to the hemlock, birch, maple, oak, and fern.